The aerospace and defense communities utilize laser systems for illumination and targeting in conjunction with many types of sensor systems located on multiple types of platforms with various laser performance parameters. Q-Peak’s ability to leverage technologies that span wavelengths from the UV to the LWIR at various powers, pulse energy levels, PRF’s, and Beam qualities gives the user multiple options for systems trades. Illuminators for Directed Energy come is a few different types in order to complete the beam control sequence and deliver the final high power laser. Supporting the beam control system are the Track Illumination Laser and the Beacon Illumination Laser. The Track Illuminator Lasers (TIL) is a necessity for Directed Energy (DE) applications involving land, sea, and air mission scenarios. The TIL preferably operates in the eyesafe wavelength regime and is used in conjunction with the DE beam control system to track the target of interest. The Beacon Illumination Laser (BIL) provides a point source return signal from the target to support the adaptive optical function of the beam control system. The function provides optical characterization of the atmosphere for the Directed Energy Laser to operate effectively. A Targeting Laser Systems (TLS) is used to illuminate (designate) a target of interest with a defined pulse repetition frequency that is detected and geo-located by the targeting sensor providing the fire control solution for a laser guided missile. 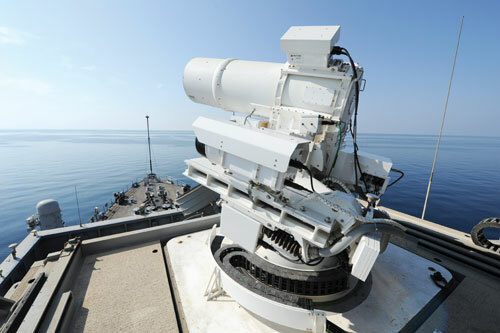 These laser systems are used in abundance with dismounted soldiers, vehicles, ships, and aircraft targeting systems.